The springtime sublimation process of Mars’ southern seasonal polar CO2 ice cap features dark fan-shaped deposits appearing on the top of the thawing ice sheet. The fan material likely originates from the surface below the ice sheet, brought up via CO2 jets breaking through the seasonal ice cap. Once the dust and dirt is released into the atmosphere, the material may be blown by the surface winds into the dark streaks visible from orbit. Wind-blown dune sand can wear away the Martian surface and uncover geologic units, which have not been exposed to prolonged space radiation. We studied migrating sand dunes at the eight potential Mars 2020 Rover landing sites, a mission that will explore astrobiologically relevant ancient environments. These locations may be favorable for the preservation of ancient life and organics for sampling by future Mars missions, including the Mars 2020 mission. Results indicate that candidate sites at Syrtis Major and Jezero crater showed the most evidence for ongoing sand transport and erosion potential. Recent liquid water flow on Mars has been proposed based on geomorphological features, such as gullies. Recurring slope lineae—seasonal flows that are darker than their surroundings—are candidate locations for seeping liquid water on Mars today, but their formation mechanism remains unclear. Topographical analysis shows that the terminal slopes of recurring slope lineae match the stopping angle for granular flows of cohesionless sand in active Martian aeolian dunes. In Eos Chasma, linea lengths vary widely and are longer where there are more extensive angle-of-repose slopes, inconsistent with models for water sources. These observations suggest that recurring slope lineae are granular flows. The preference for warm seasons and the detection of hydrated salts are consistent with some role for water in their initiation. However, liquid water volumes may be small or zero, alleviating planetary protection concerns about habitable environments. It is now known unambiguously that wind-driven bedform activity is occurring on the surface of Mars today, including early detections of active sand dunes in Meridiani Planum’s Endeavour crater. Many of these reports are only based on a few sets of observations of relatively isolated bedforms and lack regional context.Here, we investigate aeolian activity across central Meridiani Planum and test the hypothesis that dune sites surrounding Endeavour crater are also active and part of region-wide sediment migration driven by northwesterly winds. All 13 dune fields investigated clearly showed evidence for activity and the majority exhibited dune migration (average rates of 0.6 m/Earth-year).Observations indicate substantial geographic and temporal heterogeneity of dune crest fluxes across the area and per site. Locations with multiple time steps indicate dune sand fluxes can vary by a factor of five, providing evidence for short periods of rapid migration followed by near-stagnation. In contrast, measurements at other sites are nearly identical, indicating that some dunes are in a steady-state as they migrate. The observed sediment transport direction was consistent with a regional northeasterly-to-northwesterly wind regime, revealing more variations than were appreciated from earlier, more localized studies. Craters containing shallow, degraded, flat-floored interiors tended to have dunes with high sediment fluxes/activity, whereas local kilometer-scale topographic obstructions (e.g., central peaks, yardangs) were found to be inversely correlated with dune mobility. Finally, the previous, more limited detections of dune activity in Endeavour crater have been shown to be representative of a broader, region-wide pattern of dune motion. Matthew Chojnacki, Alfred McEwen, Colin Dundas, Lujendra Ojha, Anna Urso, and Sarah Sutton. One of the major Mars discoveries of recent years is the existence of Recurring Slope Lineae (RSL), which suggests that liquid water occurs on or near the surface of Mars today. These dark and narrow features emerge from steep, rocky exposures, and incrementally grow, fade, and re-form on a seasonal basis and are detected in images from the High Resolution Imaging Science Experiment (HiRISE) camera. RSL are known to occur at scattered mid-latitude and equatorial sites with little spatial connection to one another. One major exception is the steep, low-albedo slopes of Melas and Coprates Chasmata, in Valles Marineris where RSL are detected among diverse geologic surfaces (e.g., bedrock, talus) and landforms (e.g., inselbergs, landslides). New images show topographic changes including sediment deposition on active RSL slopes. Mid-wall locations in Coprates and Melas appear to have more areally extensively abundant RSL and related fans as compared with other RSL sites found on Mars. Water budget estimates for regional RSL are on the order of 105 to 106 m3 of fluid, for depths of 10 to 100 mm, and suggest a significant amount of near-surface water might be present. Many RSL are concentrated near local topographic highs, such as ridge crests or peaks, which is challenging to explain via groundwater or ice without a recharge mechanism. Collectively, results provide additional support for the notion that significant amounts of near-surface water can be found on Mars today, and suggest a widespread mechanism, possibly related to the atmosphere, is recharging RSL sources. Determining whether liquid water exists on the Martian surface is central to understanding the hydrologic cycle and potential for extant life on Mars. Recurring slope lineae, narrow streaks of low reflectance compared to the surrounding terrain, appear and grow incrementally in the downslope direction during warm seasons when temperatures reach about 250–300K, a pattern consistent with the transient flow of a volatile species. Brine flows (or seeps) have been proposed to explain the formation of recurring slope lineae, yet no direct evidence for either liquid water or hydrated salts has been found4. Here we analyze spectral data from the Compact Reconnaissance Imaging Spectrometer for Mars instrument onboard the Mars Reconnaissance Orbiter from four different locations where recurring slope lineae are present. We find evidence for hydrated salts at all four locations in the seasons when recurring slope lineae are most extensive, which suggests that the source of hydration is recurring slope lineae activity. The hydrated salts most consistent with the spectral absorption features we detect are magnesium perchlorate, magnesium chlorate and sodium perchlorate. Our findings strongly support the hypothesis that recurring slope lineae form as a result of contemporary water activity on Mars. Matthew Chojnacki, Jeffrey R. Johnson, Jeffrey E. Moersch, Lori K. Fenton, Timothy I. Michaels, and James F. Bell III. Aeolian-driven bedform activity is now known to occur in many regions of Mars, based on surface and orbital observation of contemporary martian ripple and dune mobility events. Many of these sites have only been monitored with sufficient resolution data for the last few Mars years, when the High Resolution Imaging Science Experiment (HiRISE) began acquiring images of Mars. One exception is the well-monitored Endeavour crater in Meridiani Planum, which was one of the first known sites of unambiguous dune activity (migration and deflation). However, those early detections used lower resolution data over longer temporal baselines (versus the HIRISE imagery now available), leaving some measurements poorly constrained. New orbital and surface observations of Endeavour show multiple spatial (cm, m, km) and temporal (seasons, Mars Year) scales of aeolian-driven surface change, which confirms earlier reports. Dome dunes in the eastern portion of the crater persistently deflate, disseminating dark sand across lighter-toned regolith and/or eroded bright dust, and likely also contribute to the crater interior’s episodic decreases in orbital albedo measurements. Other dome dunes are detected with the highest migration rates (4-12 m per Mars year) and volumetric sand fluxes reported yet for Mars. Estimated dune construction times or “turnover times” here and elsewhere on Mars are significantly shorter than martian obliquity cycles, implying that it is not necessary to invoke paleoclimate wind regimes to explain current dune morphologies. Located on the crater rim, the Opportunity rover detected evidence for near- and far-field aeolian-driven activity, with observations of spherules/sand movement in the rover workspace, bedform albedo alteration, and dust-lifting events. Observations of intracrater dunes show periodic shifting dark streaks that significantly constrain local wind regimes (directionality and seasonality). Constraints on wind directions from surface and orbital images show that aeolian bedforms can be extremely active in bi-, and possibly tri-, modal wind regimes, and during periods without major dust storms. Spacecraft imaging of Mars’ south polar region during mid-southern summer of Mars Year 28 (2007) observed bright halo-like features surrounding many of the pits, scarps and slopes of the heavily eroded carbon dioxide ice of the South Polar Residual Cap (SPRC). These features had not been observed before, and have not been observed since. We report on the results of an observational study of these features, and spectral modeling of the SPRC surface at the time of their appearance. Image analysis was performed using data from MRO’s Context Camera (CTX), and High Resolution Imaging Science Experiment (HiRISE), as well as images from Mars Global Surveyor’s (MGS) Mars Orbiter Camera (MOC). Data from MRO’s Compact Reconnaissance Imaging Spectrometer for Mars (CRISM) were used for the spectral analysis of the SPRC ice at the time of the halos. These data were compared with a Hapke reflectance model of the surface to constrain the formation mechanism of these features. We find that the unique appearance of these features is intimately linked to a near-perihelion global dust storm that occurred shortly before the halos were observed. The combination of vigorous summertime sublimation of carbon dioxide ice from sloped surfaces on the SPRC and simultaneous settling of dust from the global storm, resulted in a sublimation wind that deflected settling dust particles away from the edges of these slopes, keeping these areas relatively free of dust compared to the rest of the cap. The fact that the halos were not exhumed in subsequent years indicates a positive mass-balance for flat portions of the SPRC in those years. A net accumulation mass-balance on flat surfaces of the SPRC is required to preserve the cap, as it is constantly being eroded by the expansion of the pits and scarps that populate its surface. Although low-albedo sand is a prevalent component of the martian surface, sources and pathways of the sands are uncertain. As one of the principal present-day martian sediment sinks, the Valles Marineris (VM) rift system hosts a diversity of dune field populations associated with a variety of landforms that serve as potential sediment sources, including spur-and-gully walls, interior layered deposits (ILDs), and landslides. Here, we test the hypothesis that VM dune fields are largely derived from a variety of local and regional (intra-rift) sediment sources. Results show several dune fields are superposed on ancient wall massifs and ILDs that are topographically isolated from extra-rift sand sources. Spectral analysis of dune sand reveals compositional heterogeneity at the basinal-, dune field-, and dune-scales, arguing for discrete, relatively unmixed sediment sources. In Coprates and Melas chasmata, mapping is consistent with the principle sand source for dunes being Noachian-aged upper and lower wall materials composed of primary (igneous) minerals and glasses, some of which show evidence for alteration. In contrast, dune fields in Capri, Juventae, and Ganges chasmata show evidence for partial sediment derivation from adjacent Early Hesperian-aged hydrated sulfate-bearing ILD units. This finding indicates that these ILDs act as secondary sand sources. Dunes containing “soft” secondary minerals (e.g., monohydrated sulfate) are unlikely to have been derived from distant sources due to the physical weathering of sand grains during transport. Isolated extra-rift dune fields, sand sheets, and sand patches are located on the plateaus surrounding VM and the adjoining areas, but do not form interconnected networks of sand pathways into the rift. If past wind regimes (with respect to directionality and seasonality) were consistent with more recent regimes inferred from morphological analysis (i.e., dune slip faces, wind streaks), and were sufficient in strength and duration, small dune populations within Aurorae Chaos and north of eastern VM might have resulted from extended sand pathways into VM. However, we favor local and regional derivation of dune sand from a variety of intra-rift lithologic sources for most cases. Dune sand sources and the mechanism by which the sand is liberated are discussed in the context of findings described herein, but are broadly applicable to analysis of sediment production elsewhere on Mars. The presence of liquid water is a requirement of habitability on a planet. Possible indicators of liquid surface water on Mars include intermittent flow-like features observed on sloping terrains. These recurring slope lineae are narrow, dark markings on steep slopes that appear and incrementally lengthen during warm seasons on low-albedo surfaces. The lineae fade in cooler seasons and recur over multiple Mars years. Recurring slope lineae were initially reported to appear and lengthen at mid-latitudes in the late southern spring and summer and are more common on equator-facing slopes where and when the peak surface temperatures are higher. Here we report extensive recurring slope linea activity in equatorial regions of Mars, particularly in the deep canyons of Valles Marineris, from analysis of data acquired by the Mars Reconnaissance Orbiter. We observe the lineae to be most active in seasons when the slopes often face the sun. Expected peak temperatures suggest that activity may not depend solely on temperature. Although the origin of the recurring slope lineae remains an open question, our observations are consistent with intermittent flow of briny water. Such an origin suggests surprisingly abundant liquid water in some near-surface equatorial regions of Mars. This site along Coprates ridge shows RSL on generally north-facing slopes in northern summer/southern winter (latitude 12.9 degrees S, longitude 295.5 degrees E). South is down, and most slopes face northwest. IRB color (near-infrared, red, and blue-green bandpasses displayed as red, green, and blue, respectively) with a min-max stretch illustrates the “greenish” fans and deposits associated with RSL. Two of these fans transition downslope into ripples (see also figure 2 of the Nature Geoscience paper). All of the lineae here and in the larger scene appear to originate from relatively bright bedrock outcrops. Note that some of the fans that RSL flow over became darker and brighter over time. Image is approximately 950 meters wide. Rocks dominated by the silicate minerals quartz and feldspar are abundant in Earth's upper continental crust. Yet felsic rocks have not been widely identified on Mars, a planet that seems to lack plate tectonics and the associated magmatic processes that can produce evolved siliceous melts on Earth. If Mars once had a feldspar-rich crust that crystallized from an early magma ocean such as that on the Moon, erosion, sedimentation and volcanism have erased any clear surface evidence for widespread felsic materials. Here we report near-infrared spectral evidence from the Compact Reconnaissance Imaging Spectrometer for Mars onboard the Mars Reconnaissance Orbiter for felsic rocks in three geographically disparate locations on Mars. Spectral characteristics resemble those of feldspar-rich lunar anorthosites, but are accompanied by secondary alteration products (clay minerals). Thermodynamic phase equilibrium calculations demonstrate that fractional crystallization of magma compositionally similar to volcanic flows near one of the detection sites can yield residual melts with compositions consistent with our observations. In addition to an origin by significant magma evolution, the presence of felsic materials could also be explained by feldspar enrichment by fluvial weathering processes. Our finding of felsic materials in several locations on Mars suggests that similar observations by the Curiosity rover in Gale crater may be more widely applicable across the planet. Planetary dune field properties and their bulk bedform morphologies relate to regional wind patterns, sediment supply, climate, and topography. On Mars, major occurrences of spatially contiguous low-albedo sand dunes are primarily found in three major topographic settings: impact craters, high-latitude basins, and linear troughs or valleys, the largest being the Valles Marineris (VM) rift system. As one of the primary present day martian sediment sinks, VM holds nearly a third of the non-polar dune area on Mars. Moreover, VM differs from other regions due to its unusual geologic, topographic, and atmospheric setting. Herein, we test the overarching hypothesis that VM dune fields are compositionally, morphologically, and thermophysically distinct from other low- and mid-latitude (50 degrees N-50 degrees S latitude) dune fields. Topographic measurements of dune fields and their underlying terrains indicate slopes, roughnesses, and reliefs to be notably greater for those in VM. Variable VM dune morphologies are shown with topographically-related duneforms (climbing, falling, and echo dunes) located among spur-and-gully wall, landslide, and chaotic terrains, contrasting most martian dunes found in more topographically benign locations (e.g., craters, basins). VM dune fields superposed on Late Amazonian landslides are constrained to have formed and/or migrated over >10s of kilometers in the last 50 My to 1 Gy. Diversity of detected dune sand compositions, including unaltered ultramafic minerals and glasses (e.g., high and low-calcium pyroxene, olivine, Fe-bearing glass), and alteration products (hydrated sulfates, weathered Fe-bearing glass), is more pronounced in VM. Observations show heterogeneous sand compositions exist at the regional-, basinal-, dune field-, and dune-scales. Although not substantially greater than elsewhere, unambiguous evidence for recent dune activity in VM is indicated from pairs of high-resolution images that include: dune deflation, dune migration, slip face modification (e.g., alcoves), and ripple modification or migration, at varying scales (10s-100s m2). We conclude that VM dune fields are qualitatively and quantitatively distinct from other low- and mid-latitude dune fields, most readily attributable to the rift’s unusual setting. Moreover, results imply dune field properties and aeolian processes on Mars can be largely influenced by regional environment, which may have their own distinctive set of boundary conditions, rather than a globally homogenous collection of aeolian sediment and bedforms. Long, narrow grooves found on the slopes of martian sand dunes have been cited as evidence of liquid water via the hypothesis that melt-water initiated debris flows eroded channels and deposited lateral levées. However, this theory has several short-comings for explaining the observed morphology and activity of these linear gullies. We present an alternative hypothesis that is consistent with the observed morphology, location, and current activity: that blocks of CO2 ice break from over-steepened cornices as sublimation processes destabilize the surface in the spring, and these blocks move downslope, carving out levéed grooves of relatively uniform width and forming terminal pits. To test this hypothesis, we describe experiments involving water and CO2 blocks on terrestrial dunes and then compare results with the martian features. Furthermore, we present a theoretical model of the initiation of block motion due to sublimation and use this to quantitatively compare the expected behavior of blocks on the Earth and Mars. The model demonstrates that CO2 blocks can be expected to move via our proposed mechanism on the Earth and Mars, a nd the experiments show that the motion of these blocks will naturally create the main morphological features of linear gullies seen on Mars. The discovery of 248 dated impact sites known to have formed within the last few decades allows us to refine the current cratering rate and slope of the production function at Mars. 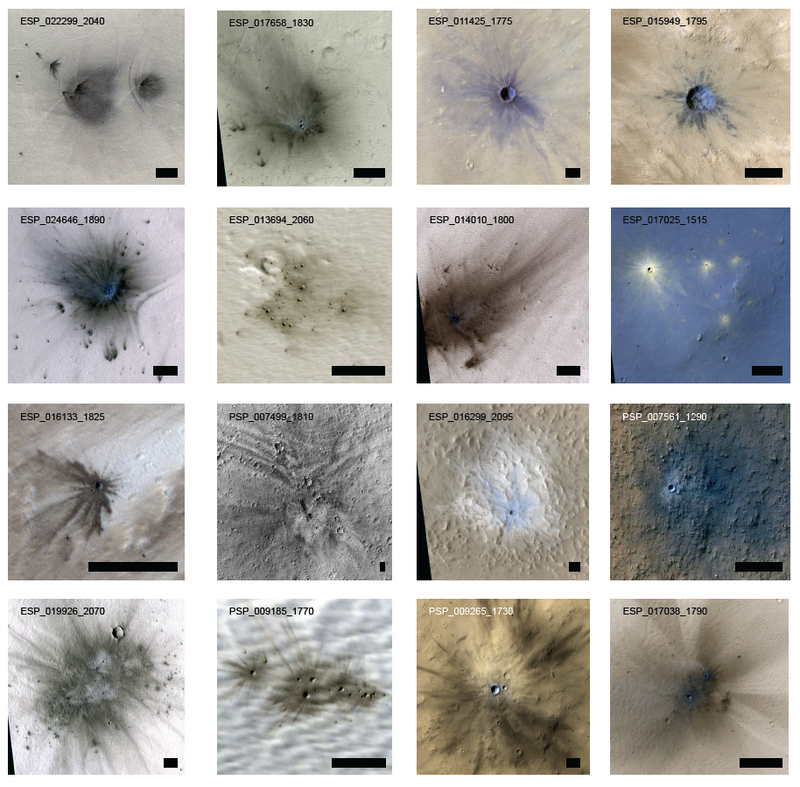 We use a subset of 44 of these new craters that were imaged before and after impact by Mars Reconnaissance Orbiter's Context Camera -- a thoroughly searched data set that minimizes biases from variable image resolutions. We find the current impact rate is 1.65×10-6 craters with an effective diameter ≥ 3.9 meters / km2 / year, with a differential slope (power-law exponent) of -2.45 ± 0.36. This results in model ages that are factors of three to five below the Hartmann (2005) and Neukum et al. (2001)/Ivanov (2001) model production functions where they overlap in diameter. The best-fit production function we measure has a shallower slope than model functions at these sizes, but model function slopes are within the statistical errors. More than half of the impacts in this size range form clusters, which is another reason to use caution when estimating surface ages using craters smaller than ~50 meters in diameter. Spring sublimation of the seasonal CO2 northern polar cap is a dynamic process in the current Mars climate. Phenomena include dark fans of dune material propelled out onto the seasonal ice layer, polygonal cracks in the seasonal ice, sand flow down slipfaces, and outbreaks of gas and sand around the dune margins. These phenomena are concentrated on the north polar erg that encircles the northern residual polar cap. The Mars Reconnaissance Orbiter has been in orbit for three Mars years, allowing us to observe three northern spring seasons. Activity is consistent with and well described by the Kieffer model of basal sublimation of the seasonal layer of ice applied originally in the southern hemisphere. Three typical weak spots have been identified on the dunes for escape of gas sublimed from the bottom of the seasonal ice layer: the crest of the dune, the interface of the dune with the interdune substrate, and through polygonal cracks in the ice. Pressurized gas flows through these vents and carries out material entrained from the dune. Furrows in the dunes channel gas to outbreak points and may be the northern equivalent of southern radially-organized channels (“araneiform” terrain), albeit not permanent. Properties of the seasonal CO2 ice layer are derived from timing of seasonal events such as when final sublimation occurs. Modification of dune morphology shows that landscape evolution is occurring on Mars today, driven by seasonal activity associated with sublimation of the seasonal CO2 polar cap. Strong and sustained winds on Mars have been considered rare, on the basis of surface meteorology measurements and global circulation models, raising the question of whether the abundant dunes and evidence for wind erosion seen on the planet are a current process. Recent studies showed sand activity, but could not determine whether entire dunes were moving—implying large sand fluxes—or whether more localized and surficial changes had occurred. Here we present measurements of the migration rate of sand ripples and dune lee fronts at the Nili Patera dune field. We show that the dunes are near steady state, with their entire volumes composed of mobile sand. The dunes have unexpectedly high sand fluxes, similar, for example, to those in Victoria Valley, Antarctica, implying that rates of landscape modification on Mars and Earth are similar. Water likely flowed across ancient Mars, but whether it ever exists as a liquid on the surface today remains debatable. Recurring slope lineae (RSL) are narrow (0.5-5 m), relatively dark markings on steep (25°-40°) slopes; repeat MRO/HiRISE images show them to appear and incrementally grow during warm seasons and fade in cold seasons. They extend downslope from bedrock outcrops, often associated with small channels, and hundreds of them form in rare locations. RSL appear and lengthen in the late southern spring/summer from 48°S to 32°S latitudes favoring equator-facing slopes--times and places with peak surface temperatures from ~250-300 K. Liquid brines near the surface might explain this activity, but the exact mechanism and source of water are not understood. Science: Is Mars Weeping Salty Tears? Despite radically different environmental conditions, terrestrial and Martian dunes bear a strong resemblance, indicating that the basic processes of saltation and grainfall (sand avalanching down the dune slipface) operate on both worlds. Here we show that Martian dunes are subject to an additional modification process not found on the Earth: springtime sublimation of Mars’ CO2 seasonal polar caps. Numerous dunes in Mars’ north polar region have experienced morphological changes within a Mars year, detected in images acquired by the High Resolution Imaging Science Experiment (HiRISE) on the Mars Reconnaissance Orbiter (MRO). Dunes show new alcoves, gullies, and dune apron extension. This is followed by remobilization of the fresh deposits by the wind, forming ripples and erasing gullies. The widespread nature of these rapid changes, and the pristine appearance of most dunes in the area, implicates active sand transport in the vast polar erg in Mars’ current climate. We report on the discovery of columnar jointing in Marte Valles, Mars. These columnar lavas were discovered in the wall of a pristine, 16-km-diameter impact crater and exhibit the features of terrestrial columnar basalts. There are discontinuous outcrops along the entire crater wall, suggesting that the columnar rocks covered a surface area of at least 200 sq. km, assuming that the rocks obliterated by the impact event were similarly jointed. We also see columns in the walls of other fresh craters in the nearby volcanic plains of Elysium Planitia-Amazonis Planitia, which include Marte Vallis, and in a well-preserved crater in northeast Hellas. HiRISE images reveal (1) abundant boulders in surface units previously interpreted as fine-grained deposits from water or the air; (2) further evidence for water-carved gullies, although the most recent bright gully deposits could have been dry flows; and (3) evidence that recent large craters were the result of impact into volatile-rich ground. These results should help focus future exploration of Mars. With detailed images from the HiRISE camera, a dome of layered ice deposits on the north pole of Mars comes into sharper focus, showing evidence of recent mass wasting, flow and debris accumulation. Athabasca Valles is a young “outflow” channel system in the equatorial region of Mars. Most researchers agree that it was carved by catastrophic floods of water, and some believe that frozen floodwaters survive to this day on the channel floor. However, new HiRISE observations reveal that Athabasca Valles is entirely coated by a thin veneer of solidified lava. The lava poured from a fissure, filled the channels, and then drained downstream leaving behind a thin layer of hard rock to coat and preserve the channel system.